Makutu’s Island is vast and has many areas to explore. I would like to introduce you to the different play areas on the island so that you feel familiar when you come visit us. This is the big brown tree located at the center of the Makutu’s Island. It is designed for kids who are at least 5 years or older. The tree has a huge trunk that you can go into and climb the ladders and poles inside it. The trunk has multiple levels, slides, and tunnels that connect the other parts of the island. Once inside the tree trunk you have so many paths to explore and so much of fun in each path. Behind the banana tree is a net that you can climb onto and reach one of the favorite places on the island – The Zip Tracker. It is a mini zip line for kids that allows them to hang on to the bar and zip through the line for a short distance. The fantasy tree is the one towards the left of the big banana tree. The blue tree trunk has an opening that allows you to go in and climb the planks inside the trunk. Once you reach the top level of the trunk you will find a tunnel made of a sturdy meshed net that connects to the trunk of the big banana tree. As you crawl through this net, it feels like you are inside the branch of a tree. 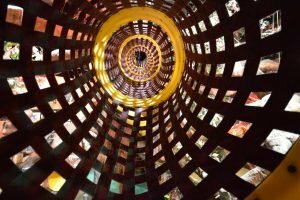 Behind the Fantasy Tree, you will find stairs and a tunnel that leads you to the entrances of the double helix slide. You can choose whichever tunnel you like and slide one of the helices. This slide is steep and is like the coil of a spiral notebook. It is the probably the longest and the most thrilling slide on the island. This is the bungee trampoline that’s will make you feel like you are soaring the skies. It is a trampoline that has a round base and poles on the side. A harness is tied to the poles and will support you as you start jumping and flying high on the trampoline. Inferno is the arcade games area on Makutu’s Island. You can purchase tokens at the counter or use the token machine on the side. The tokens allow you to play many games like Whack N Win, Ice Ball, Shoot N Hoops, Down the Clown, Fishbowl Frenzy, Air Fx, Smokin Token Extreme, etc. There is also a photo booth that lets you capture your memories. This is the play area that is exclusively for toddlers (3 years and below). 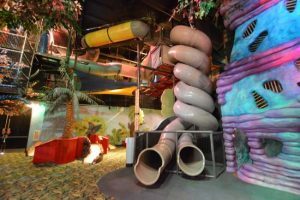 It has rock climbing, obstacle course, slides, tunnels and soft cushions for your toddlers to crawl, run and bounce around. Kiki’s cafen has a nice dining area and even has to-go options during lunchtime on the weekdays. The menu consists of gourmet pizzas, bar food style snacks like wings, quesadilla’s, curly fries, samosas and even beer on the tap. 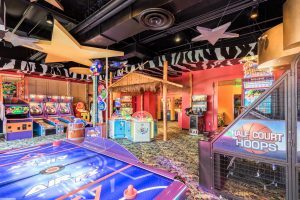 It has free WiFi and charging stations that allows you get some work done or entertain yourself while your kids are having a blast in the play area. 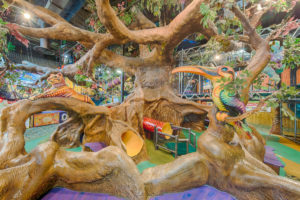 There are also two reclining massage chairs that let you rejuvenate while you still keep an eye on your kids as they have fun on Makutu’s Island. Check out the menu here.